The extent of women’s hair loss. More often than not, society assumes that baldness only affects men, but the alarming number of women who experience unwanted hair loss is far greater than you might expect. This incorrect assumption makes it far more difficult for women to seek proper treatments or hair restoration solutions as they often feel ashamed and embarrassed about their hair loss. Hair loss affects women all over the world and it is more prevalent than most people realise. It is estimated that it touches the lives of about 40% of adult women. More precisely, it affects approximately one-third of women and two-thirds of postmenopausal women. In Australia this equates to about 2.2 million women with moderate thinning, extreme hair loss affects about 700,000 women. It is our view that this number is growing, certainly, gover the last 20 years we have certainly seen a dramatic rise in female hair loss. Typically, it affects adult women over the age of 25 years old, however, it can strike at any age; from very young (we have seen children as young as two years old with total hair loss) to the very old. Hair loss is a natural part aging and virtually every woman will experience hair thinning of some kind, however, many don’t realise how prevalent it is among younger women. It strikes at a time in their life when they are supposed to look their best, feel their best and look their best. It can be crushing to a young woman’s confidence. The most common form of women’s hair loss is female pattern thinning or androgenetic alopecia, it accounts for about 85% of all women’s hair loss. It can be triggered anytime after puberty depending on your DNA, but no one know the time when it will be begin. It is our experience that more and more women are being affected by hair loss at a younger age. Once we only used to see women over 40 years of age, today we see many women under 30 seeking help and treatment. Thankfully, we have developed a wonderful range of hair thickening products for women that promise an instant boost to your confidence cosmetically making your hair look instantly thicker. Take a closer look at Biothik Hair thickening Products today! 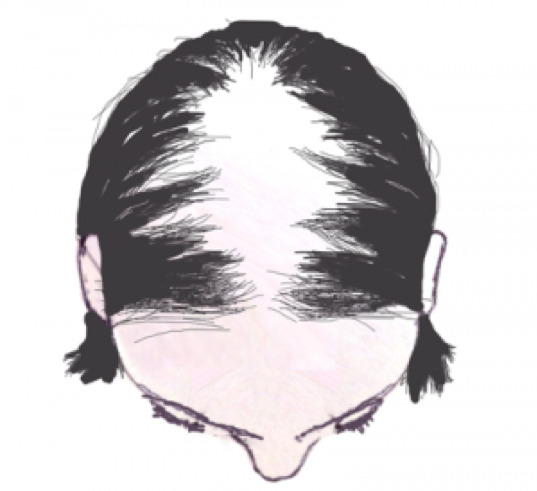 Androgenetic Alopecia is often considered to be a hereditary form of hair loss. It is more commonly known as male or female pattern thinning. It is caused by a change in the hormones, specifically the androgens, whereby the 5-alpha reductase enzyme combines with the testosterone hormone to produce dihydrotestosterone (DHT). If you happen to be one of the unlucky ones whose follicles are susceptible to effects of DHT they will begin to experience a miniaturization. Symptoms of this process are hairs becoming weaker, finer, they don’t grow as long as they once used, becoming baby fine ‘downy’ hair, it becomes almost impossible to style as most of the hair looks ‘fly away’. The final result of this process of miniaturization is hair mortality (also known as hair death). The hair regresses from an adult state to an infant state, you could say it’s like the “Benjamin Button” syndrome applied to your hair. Generally, most women do not lose their front hairline like men, but they will experience general thinning through the front, top, crown and also the sides of their head. Many women feel that when they have hair loss, they’ve lost a large part of who they are. The good news is that BioTHIK Australia has clinically proven hair loss treatments for women, to help with hair regrowth and to make your hair look significantly thicker. It will help you to your hair and your confidence back and make your look years younger. Beautiful full thick hair defines many things for a woman – personality, attractiveness, success, health and social status, just to name a few. Losing hair can have a severely negative effect on both a woman’s self-esteem and her social life. We know many women how have stopped going out, avoid seeing their friends and don’t care to go to large family events. It can be difficult to reach out for help as feelings of hopelessness set in. Although Angrogentic Alopecia is common, it can be an isolating experience for women going through it as it is one of topics that women don’t talk about, especially when it is happening to them. Hair thinning creates an extraordinary emotional roller coaster for those who suffer it’s effect. Hair loss can be distressing and depressing for men, but it takes a whole new dimension with women. Unlike men, the experience for women can be far more traumatic as common social constructs and, arguably, psychological hard wiring in our DNA make it virtually impossible for them to feel attractive without a full head of hair. Some may argue against this idea that a woman’s love of hair is genetically hard wired, but you don’t tend to see young boys playing with each others hair; brushing it, plaiting and glorying in it. Many women will confirm how closely linked their hair is to their identity, when they start losing it it can be devastating at a very foundational level. A study conducted by the Journal of the American Academy of Dermatology showed that women suffered more emotionally and mentally, and were more likely to develop a negative body image due to hair loss when compared to men who were dealing with the same issue. On the other hand, almost 75 per cent of women feel less confident about themselves with the onset of hair loss, while 60 per cent of men with hair loss say that they have been ridiculed for their baldness at some point in their lives. Hair reflects a person’s style and who they are. Their hair is often an outworking of their personality and even how they are feeling. It is no secret, when a girl is feeling fun and girly she may wear her hair out in curls or in a fun style. W hen she is at work (especially in the corporate world) she might take on a sleek and straight look. It was reported in an interview on the David Letterman show that the actress in the TV series “The Good Wife” wore a $15,000AUD wig to achieve this daily corporate, straight look on set instead of her naturally curly hair. Curly hair simply isn’t deemed to have the serious corporate look and tone about it. Or, if she is feeling very serious, she might wear her hair back in tight bun. Furthermore, image and presentation is critical in the workplace and our hair plays a huge role in this. One study showed a sales team always sales by 15% simply by dressing in the colour blue than in brown. Blue suits seem to have affected the way the world looked at them and also they way they looked and felt about the world. Our hair is one of the first things that people notice about us and it has such an incredible effect upon how we look. It can make us look healthy, young and vibrant or, alternatively; unhealthy, aged beyond our years and drained of energy. Thus is can affect how people respond to us and how we are perceived, rightly or wrongly, it does have an effect. For example, hair loss can have a profound effect on someone who works in front of the camera such as in the media, or someone who is constantly in the public eye, such as educators, trainers, teachers, managers and sales people. Sales people are often acutely aware of their appearance as they know how it can affect the way people perceive you. Studies have shown that some employers are unfortunately swayed against hiring people who are balding, because they are perceived as being older and might not necessarily fit in with their company’s brand or image. According to some surveys, about 63 per cent of women claim to have career-related problems because of hair loss, it can be a massive blow to your confidence and a dark and heavy weight carry that feeling with you. There is a deep grieving that occurs when a woman loses her hair. We are not talking about a ‘bad hair day’, hair loss often precipitates a deep and raw sadness especially in women. Whenever we lose anything we grieve; it could be a pet, or a loved one, or simply a treasured trinket with emotional attachment and memories; we still grieve over these things. Of course, the deeper the attachment the deeper the grief. The kind of grief we experience from losing a $20 bill is different to the grief of losing a friend or family member, but it is grieving nevertheless. When we lose our hair we truly do lose a part of who we are. It might not affect us ‘functionally’ like a leg or an arm, but it does serve a very powerful functional purpose to communicate who we are to the outside world, how we look and how we feel (about ourselves). To lose hair, is to lose a part of who we are. In our experience, female hair loss often has the unfortunate effect of making women ashamed of who they are, as if their hair loss is their fault and they deserve it somehow. Many are forced to become secretive about their predicament, as they often find that most people don’t understand what they are feeling nor appreciate what they are going through. Even the most well-meaning family and friends often prove to be unwittingly unhelpful and hurtful. As a result, they attempt to mask their hair loss with solutions such as readily available hair extensions that often cause more harm than good. (More on that later). According to the American Academy of Dermatology, the average woman will lose about 100-150 hairs per day. On the days when hair is washed, she can lose up to 250 strands. Sometimes women will avoid washing in an attempt to keep the hair and reduce hair fall, but this is futile as washing doesn’t cause hair loss, it merely assists those hair that have stopped growing to come out of the scalp. This is all part of the natural hair life cycle – hair grows (anagen phase), it stops growing and rests in the scalp (catagen phase) then it falls out (telogen phase), then the hair lies dormant for a while and usually begins to grow again. Although some people will go to great lengths to count how many hairs they are losing everyday, there are easier ways to detect if you are thinning more than usual. You will see a difference when waking up in the morning, there may be an unusually large amount on your pillow. When you comb your hair (especially without tugging, which can pull the hair out), more than normal will be left in the comb. When shampooing your hair the drain may get clogged more rapidly than usual. Finding a few stray hairs on your hairbrush is not necessarily cause for alarm. There can be times of the year where you may experience greater hair fall and less hair fall at other times. It is when these seasons turn into permanent states that you have a problem. Quite often, people don’t experience ‘hair loss’, they have the same number of hairs coming out every day. Everything appears to be supporting the status quo. However, there is a slow and steady lack of hair regrowth. Hairs that should be regrowing and replacing themselves don’t, this trend is not your friend. This gradual deficit of hair will eventual result in a noticeable thinning look. It can sometimes be rapid, but usually it is slow, often people have already permanently lost over 30% of their hair before it becomes apparent. Hiding or ignoring hair loss can be extremely problematic, as female hair loss can, in some cases, be the sign of a more serious underlying medical issue that needs to be addressed. We recommend that you seek our your family doctor to get an examination, get some blood tests to ascertain if there is another more serious problem. It could highlight a previously undiagnosed underactive or overactive thyroid, hashimoto’s disease, poly cystic ovarian syndrome, depressed iron levels or vitamin D (or other nutrients), it might even highlight an auto-immune problem such as lupus. However, in most cases you will be perfectly healthy and there will be nothing wrong. In this case, you are possibly experiencing the onset of Androgenetic Alopecia, a hereditary form of hair loss. If so, your doctor may discuss with you various pharmaceutical options to prevent further loss or refer you to a dermatologist. Be sure to visit our site again for part two of the definitive guide to women’s hair loss.